Being Frugal and Making It Work: My First October Blog Giveaway Win! My First October Blog Giveaway Win! I won another great blog giveaway this week for a Diamond Candle! I also won two $5 Amazon.com gift cards and a $10 Walmart gift card! Those three wins equal more frugal gift shopping! I enter blog giveaways on a daily basis in hopes of winning some great holiday gifts - not only for Christmas, but for birthdays and other special occasions as well! Not only does it allow me to stretch my budget, it also allows me to give some pretty amazing gifts that I wouldn't be able to otherwise! 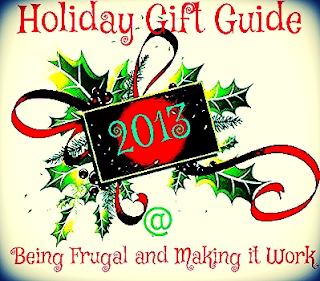 If you are looking for great blog giveaways, make sure to check out the sidebar here at Being Frugal and Making it Work. The 2013 Holiday Gift Guide is about to begin, and there are some great prizes for everyone on your holiday shopping list this year. Have you won any giveaways this month? That's great! Congrats. I never win anything either. But it sure is fun to serve someone else and help them have an extra special day! Congratulations on your wins! I won a few things last year and it was so exciting! You inspire me to enter more. There really are a lot of great giveaways out there and like you said they are a great way to save during the gifting season. It's always nice to save money any way that you can around the holidays. Thanks for this. As a fellow giveaway lover, I say congrats! :D I love winning prizes. I have a hard time winning things. Half the time that I win I don't end up getting the prizes. It's kinda strange. But I still love entering them for the small chance I will win! Congrats! I haven't won for a long time! Congrats on your wins!! I haven't won anything in awhile. Congratulations! I have been entering giveaway for diamond candle but I never get lucky. Blogging Can Be a Great Personal Online Outlet!